I recently came across the following question on Quora: What are the most interesting conspiracy theories? My answer: That the Catholic Church is hiding the lost remains of Alexander the Great. If you listened to my Ancient Heroes podcast mini-series, you might have heard the episode where I talk to British historian Andrew Chugg for nearly 2 hours about this unsolved mystery. According to Chugg’s theory, Venetian merchants stole Alexander’s remains from his tomb in Alexandria, Egypt and transferred them to Italy where they were relabeled those of Saint Mark the Evangelist (yes, that Mark). 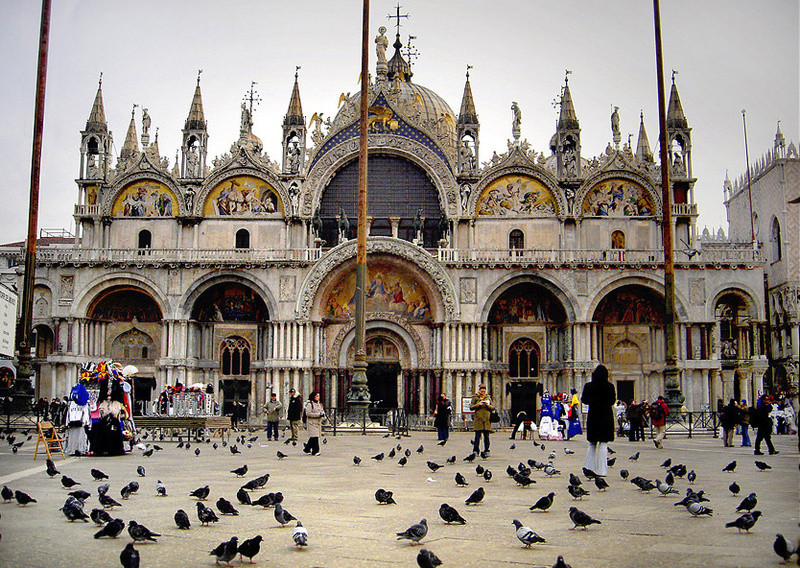 If he’s right, the bones buried at Saint Mark’s Basilica are actually those of Alexander, not of Saint Mark. It also explains why Alexander’s tomb has never been discovered in Egypt, despite hundreds of excavation attempts. As a quick refresher, Alexander the Great was a Macedonian king who died in 323 BCE after amassing an empire that stretched into three continents (Europe, Asia, and Africa). He was one history’s most successful conquerors and famously never lost a battle, even though he was often out-numbered and always fighting on enemy territory. After Alexander died, his body was sent on the road from Babylon (where he was living at the time, since we had toppled the mighty Persian Empire) back to Macedon, where members of his royal family were traditionally buried. However, en route back to Macedon, one of Alexander’s closest friends and generals intercepted his funeral caravan and took the body with him to Egypt (where Ptolemy ruled after Alexander’s death). Alexander’s tomb was in Memphis, Egypt for at least a few decades, then moved to Alexandria, a city Alexander had founded while he was alive. Many powerful leaders of the ancient world came to pay respects to Alexander’s tomb in Alexandria, including both Julius and Augustus Caesar, Cleopatra, and Caligula, as well as additional Roman Emperors and notable religious figures. Alexander the Great was a hero to many of them and, for that reason, his tomb was very well-known in ancient times. Andrew Chugg, a British historian and expert on Alexander the Great, has floated the possibility that the conqueror’s body wasn’t destroyed or lost, but actually simply renamed that of Saint Mark. The best piece of evidence for this is that immediately after we get the last historical reference (390 AD) to Alexander’s tomb being intact, Roman Emperor Theodosius I makes Christianity the official religion of the Empire and bans all non-Christian worship (391 AD). Strangely enough, this is also the same time we get the first reliable references to the existence of a tomb of Saint Mark in Alexandria. The theory goes that Christian authorities in Alexandria relabeled the mummified corpse of Alexander, who had achieved a god-like (and thus illegal) status by this time, that of Saint Mark. In essence, they traded the founder of Alexandria for one of the founders of Christianity. You have to admit it would certainly be a clever and convenient way to preserve the body/tomb without being in violation of the Empire’s new law. It also makes sense that it was kept secret. Anyways, hundreds of years after this change in the Roman Empire, the tomb was plundered and the body (of either Saint Mark or Alexander the Great) was taken away from Alexandria and to a crypt at the site now home to the famous Basilica of Saint Mark in Venice. So if this theory is correct, Alexander’s bones, not Saint Mark’s, are the ones housed in a marble sarcophagus inside the altar of the Basilica. I didn’t develop this theory, nor am I saying I subscribe to it, but it is certainly interesting (which is what the question called for). Hopefully the mystery of Alexander’s lost tomb will eventually be solved definitively. If I’ve piqued your interest, you can hear the whole story told in detail by Andrew Chugg in this episode of the Ancient Heroes podcast: The Tomb of Alexander the Great. You can also find more sources here: Alexanderstomb.com. And here’s an article from the Independent: Does the tomb of St Mark in Venice really contain the bones of Alexander the Great?